Step 1: Plan at least one month ahead of time. A signed Fundraising Agreement must be sent in to Resource Solutions to get fundraiser started. Agreements can be downloaded and faxed or mailed. See our Getting Started section for everything you will need. Step 2: After we receive your signed Fundraising Agreement we will send order forms and catalogs to you prior to your start date. We try to ship them out within a week and they usually take 4-5 days to ship UPS ground. Holiday catalogs sell out early so planning ahead makes sure you receive them in plenty of time for your sale. Step 3: Limit the timeframe for your fundraiser. We recommend no more than a 1-2 week selling period including 2 weekends. Allow time for late orders to come in. Most sales are done in 2-3 days so don’t let the fundraiser drag on for weeks. This will keep your participants motivated and on track. Step 4: Allow time for delivery. Allow at 1-2 weeks for delivery of bulk order products and 3-4 weeks for delivery of student pack catalogs. Step 5: Collect orders from students and total all forms at the bottom of each order form. 1) Tally all orders and send master order form in by fax, mail or email. 2) Payment is due upon order unless prior arrangements have been made. 3) Fill out prize order form, if applicable, and send or fax with main order. 4) Allow 1-2 weeks for brochure order to ship. If a student has multiple order forms, paperclip together and mark total number of pages at bottom of order form. Order forms do not have to be totaled. We will do this for you unless you are sending payment with your order. Keep the bottom 2 copies for your records and turn in the white copy. Mail complete package to Resource Solutions by due date. Orders not turned in by due date may be subject to delay. When sending your order forms, we recommend you use a service that can “track” the order - UPS - Fed Ex - etc. You are responsible for getting the order to Resource Solutions on time and in good condition. A computer printout will be sent to you prior to delivery of product. One “add-on” order is allowed. Add-on orders are not guaranteed to arrive with original order. All claims for missing or damaged items must be made within 14 days of receipt of order. Please group all claims together and mail or call in all at one time. Payment is due upon order unless prior arrangements have been made. Step 7: After you have sent in your order we will contact you when your order has shipped. Step 8: We will send you a suggested parent letter to send home with all fundraising participants. Please send this home as soon as possible so that everyone will be prepared to pickup products. We suggest that no product be picked up prior to 3pm and that parents pick up their fundraising products when they retrieve their children. Step 9: Most shipments will arrive UPS unless they are large orders that must be shipped on a truck line. Due to the truck line’s multiple delivery obligations, we are unable to tell you exactly what time they will deliver. Your shipment will arrive on a tractor-trailer. If your location is unable to accommodate this, let us know immediately. Step 10: It is best that the distribution be organized in a large area such as the gymnasium. Be prepared to direct the driver to a parking area as near as possible to the area where distribution will be set up. We suggest that you recruit two helpers per pallet. Step 11: Go with the driver to the truck. Make a note of the condition of the pallet and whether the plastic wrap surrounding the box is still intact. The driver will bring the boxes inside to a 1st floor location with “Inside Delivery” or hand the boxes off of the truck for someone in your organization to carry inside. Step 12: Once all of the boxes have been taken to the distribution area make a quick count of how many boxes you have received. The driver has something you must sign. Make a note on the delivery receipt of how many boxes you received and sign as the driver directs. He is now finished with his part and free to leave. Sort all boxes into each teacher’s classroom or group. Boxes should be clearly marked with student name and teacher if applicable. Sort all product into separate piles by item. It is best to arrange this in the same order as the back of your brochures. Step 14: Please inventory items to make sure you received everything ordered before you begin sorting orders. Please be diligent in not allowing anyone to take any product before you account for everything ordered. 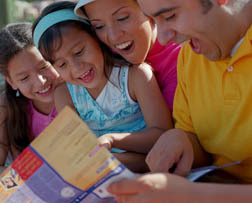 Take each child’s brochure and using the totals quantity at the bottom of each flavor, fill how many of each is needed. It would be best to set up an area for each teacher, class or grade and put each child’s order with that group. Whenever you finish with each order tape their brochure to the top of box and await distribution time. For larger orders you may want to reuse empty boxes to ease pickup. Step 16: It is now okay to allow children or parents to pick up their orders. During distribution if you become aware of any shortages or overages of product make a note on packing list (DO NOT change what you have already written as qty received). Fax as soon as possible to 316-262-7169. If you need additional product it can be shipped the following week and you must contact your distributor.